Recently, Huntington fourth graders were studying simple machines. 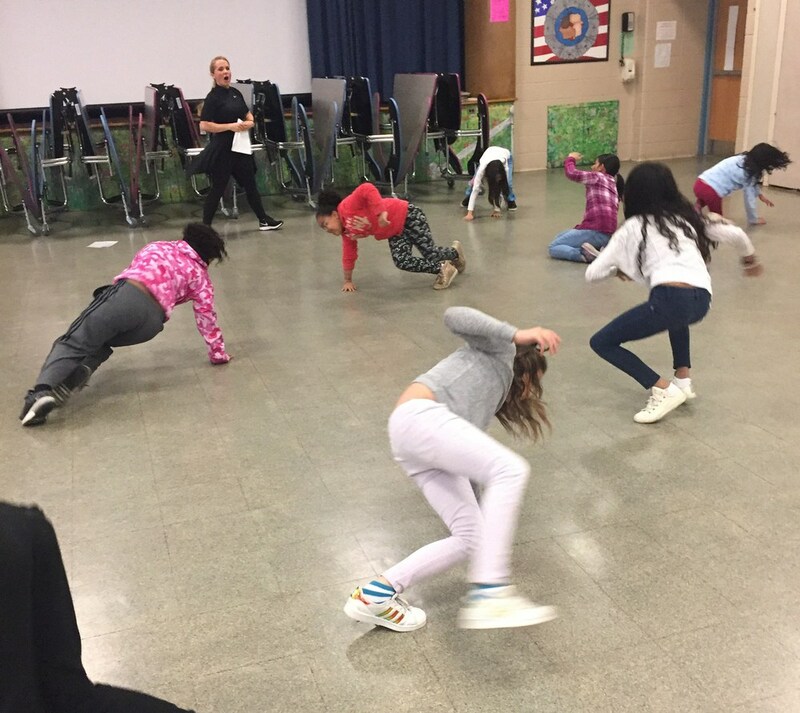 Their teachers invited dance artist Kendra Clark Mace (above, standing) to help reinforce what simple machines are and how they help us. 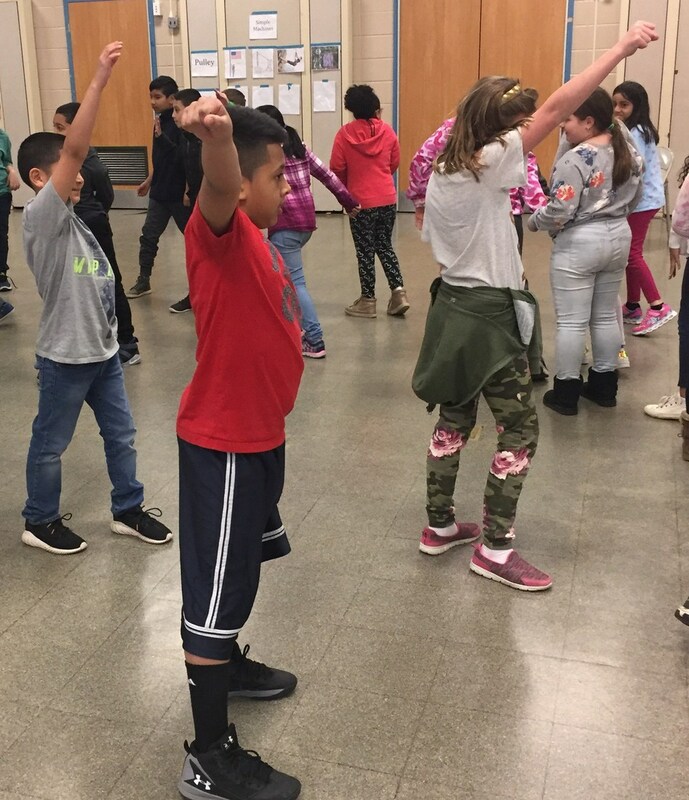 With Ms. Clark Mace’s guidance, the students created dances inspired by the six simple machines and their functions in this arts-integrated project. For each of five session, Ms. Clark Mace focused on one or two different simple machines and their functions. For example, in Session Two, the teaching artist and students explored the wheel and axle and their pushing and rotating actions. The students had recently seen a performance of The Art of Circus by CIRQUE-TACQULAR at Suffolk County Community College. The circus artists performed thrilling acrobatics inspired by visual art masterpieces. 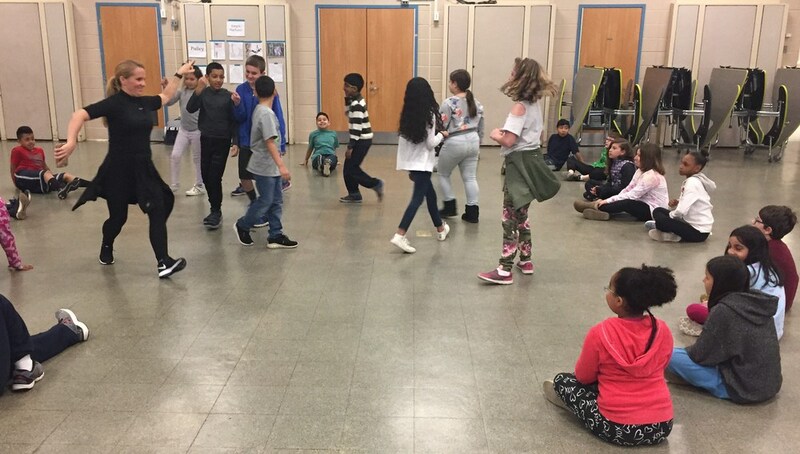 Ms. Clark Mace made a connection between the circus artists being inspired by art masterpieces and the students using simple machines to inspire dance routines. The teaching artist asked students to describe the wheel and axle. Next, she and the students played a game, during which the teaching artist introduced specific movements of a wheel and axle through a series of action. To help the students visualize, Ms. Clark Mace showed them photos of everyday objects, such as a rolling pin, door knob, record player and a rotary phone, that incorporate a wheel and axle. She discussed and modelled the pushing and rotating of each object. For the session’s final activity, the teach artist directed students to form groups. During the previous session, the students had worked on dances that illustrated the pulley action and changing direction. Ms. Clark Mace asked one group to demonstrate their pulley dance. Next, she asked the students how they might demonstrate pushing and rotating. She told the students that they would be combining the previous pulley dance with this session’s dance movements. The student groups began working on their routines. 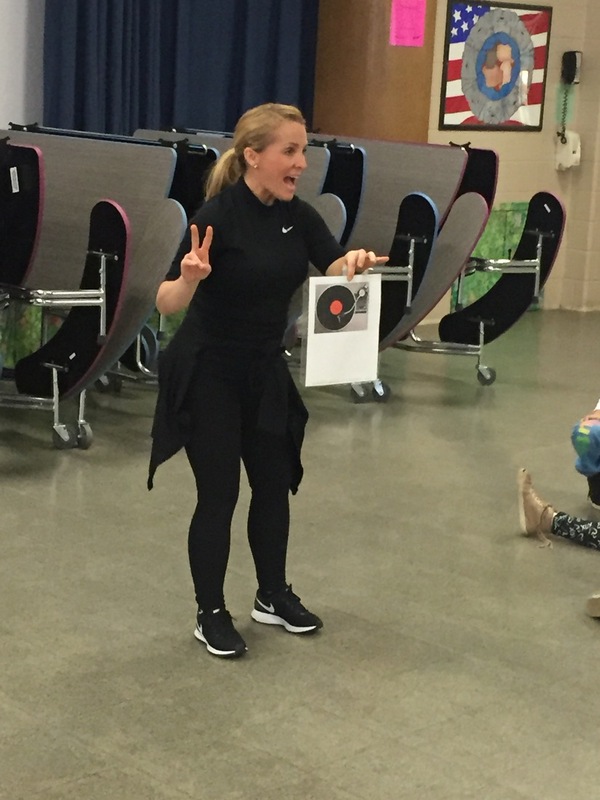 During this work period, Ms. Mace went from group to group inspiring and instructing students. The classroom teacher was also actively involved. Following the practice session, the students performed their newly-created movements. As they performed, Ms. Mace narrated, interjecting dance vocabulary. She also spoke about making mistakes and how they are an opportunity to find solutions. In subsequent sessions, students worked on the other simple machines (screw, lever, wedge and inclined plane) and physically performed their actions. In-between these sessions, the specialty teachers (ie, physical education, art and music teachers) taught lessons that supported the project. For example, the art teacher guided students in the creation of sculptures inspired by Alexander Calder and that reinforced the concepts of kinetic and potential energy. The students also learned rhythmic patterns with the music teacher. For the project’s culminating session, students shared their final routines with their classmates. They used their bodies to mimic the way the six simple machines worked.